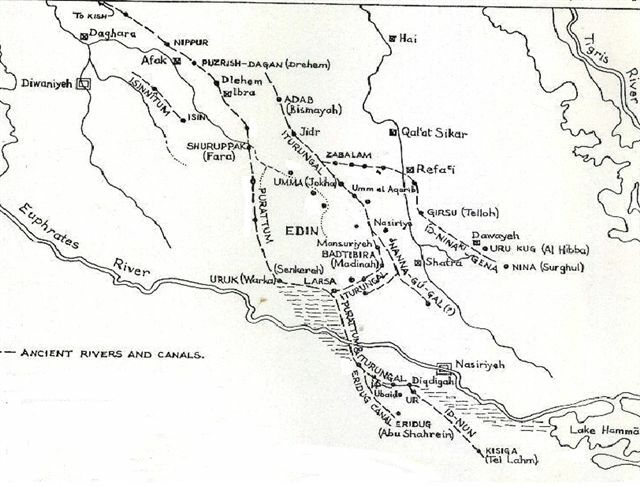 Map depicts the canal system in early Mesopotamia. Settlers from the north found an ideal location to begin the first city, Eridu. Amidst a fertile land adjacent to the Persian Gulf there was an abundance of fish, wild goat grass and emmer that could be gathered for baking bread. A luscious fruit was cultivated from the date palm, a veritable “tree of life.” An old river bed was tapped off the Euphrates and diverted to provide fresh water for drinking, bathing, and watering their livestock and crops. The desert area to the north of the city was called the “edin.” Genesis says: “And a river went out of Eden to water the garden ..." (Gen. 2:10).